Now he’s a believer, saying it does three things: gives you exposure, raises start-up funds, and provides you with a market instantly. The folks who backed the pen don’t have ownership in the product, but by supporting the pen were saying “I like your product, I want to get one and help you get it to market,” said Noveske. The backers were from the United States and beyond, including Australia, Italy, France and Singapore. The Noveskes are website developers, and credited friends with getting the word out on Facebook about the pen project. Noveske doesn’t hold a patent on his pen, saying you could spend money and make lawyers rich but it’s better to create an original idea and get it to the market quickly. “While everyone is copying it, you’re coming up with the next idea, making you the leader and them the followers,” he said. Bona Fide’s website launched Tuesday, and the pen is priced at $80. Noveske said the pen is completely serviceable, and all parts can be replaced. Noveske said there’s a possible limited-production co-branding in the works, but couldn’t reveal the details. The Noveskes say there are other products they want to pursue based on the same concept. Noveske met his wife at a map-making business he owned in California, and after moving to Oregon over 20 years ago, the two have owned an antique mall and a clock and watch repair business. He also served as president of the Towne Center Association. “It’s something fun we’re both interested in, and were able to take the idea to funding in four months,” said Kristin Noveske of the whole process. Thank You! 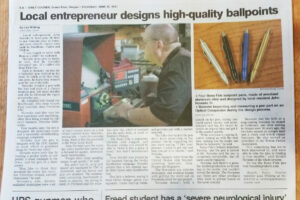 The Bona Fide Pen is Now a Reality!